I think it's safe to say that William Shakespeare's Hamlet is one of the best, most popular, and most produced plays in the world. Tom Stoppard's 1966 play Rosencrantz and Guildenstern are Dead, made into a movie in 1990, offers us an alternate view of the story from the point of view of two minor characters who, yes, end up dead at the end of the play. The Acting Company, a touring Shakespeare company with close ties to the Guthrie, is currently presenting both plays in repertory. It's a brilliant idea, and since I'm a fan of The Acting Company and I love the idea of repertory (two or more plays with the same cast) I jumped at the chance to see both plays in quick succession - Friday night Rosencrantz and Guildenstern are Dead, followed by a Saturday matinee of Hamlet. The former is absolutely hilarious and wildly entertaining, and it gave me a double pleasure in viewing the latter - the great drama and well-known language of Hamlet as well as the "secret" knowledge of what may be going on behind the scenes with poor Rosencrantz and Guildenstern. I'm sure you're all familiar with the tale of the Danish prince whose kingly father was murdered by his uncle Claudius, who then married his mother. It's no wonder he's in a bit of a funk. And that's putting it mildly; basically the play chronicles his descent into madness (or is it sanity?). Hamlet is visited by his father's ghost, who tells him that his death is no accident, so Hamlet plots to kill his uncle/father/ king with the help of his friends and a troupe of players. Let's just say it doesn't go well. It really is a beautiful play, full of drama with a bit of humor as well, with well-drawn complex characters. It's such an important and popular play that many of its lines have worked their way into our pop culture lexicon, including "the play's the thing," "the lady doth protest too much, methinks," "neither a borrower nor a lender be," "to thine own self be true," "brevity is the soul of wit," and my favorite, "the rest is silence." This is a great production, dynamic and compelling with a nice balance of light humorous moments and intense drama. And what a cast! I'll talk about them a bit later. These two minor characters appear only briefly in Hamlet. They're old friends of Hamlet that his mother and uncle send for to help him out of his funk. Basically they're used, both by Shakespeare as a way to move the plot forward, and by Claudius to get to Hamlet and then send him away to England, which is the end of them. Stoppard's reimagining of the story sees them mostly sitting around waiting for their interactions with the world of Hamlet. They have many conversations about topics like death, fate, memory, and probability (the play opens with a long scene of flipping coins, which improbably land on heads 90 times in a row), and play silly games like questions (quickly hurling questions at each other until someone breaks and makes a statement). 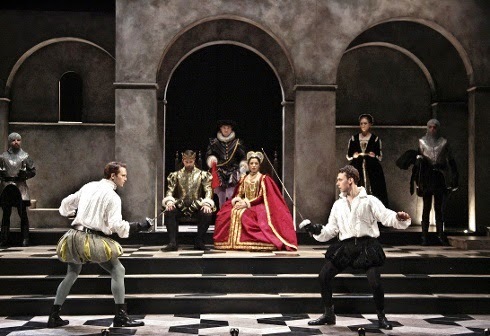 The main action of Hamlet occasionally interrupts their conversation, as they run into the troupe of players, receive their instructions from Claudius, and talk to Hamlet - a scene that's fast-forwarded as the actors mime words and move quickly while a garbled track of sped-up talking plays. We even see Hamlet's famous "to be or not to be" speech, but we don't hear it as the focus is on Rosencrantz and Guildenstern. They seem to exist only within the world of the play; they have difficulty remembering their life before and seem to know that this is the end for them. It's really clever writing by Mr. Stoppard to create this story and these characters in and around the world of one of the greatest plays ever written; he really does add to greatness. The thrill of seeing these two plays back to back by the same company is that the same actors play the same characters in both plays, so it really does seem like you're see flip sides of the same coin. The star of the shows is John Skelley as Hamlet. An Acting Company alum who's also frequently seen at the Guthrie (see last summer's gorgeously intense Long Day's Journey Into Night, for example), John is one of my favorite actors to watch because he's such a natural and present actor. This is no exception; his Hamlet is charming and funny at one moment, and crazy intense the next. In Rosencrantz and Guildenstern, he's able to play it a little looser and more comedically; he has less to do but is able to have more fun with it, almost as if he's playing two versions of the same iconic character. The other stars of the shows are the brilliant comedy team of Grant Fletcher Prewitt and Ian Gould as the slow-thinking Rosencrantz and the fast-talking Guildenstern. They work so well together and have such an easy and fun chemistry, perhaps because this is the end of their 6+ month tour. They're like Abbot and Costello, and somehow their interactions are made funnier by the fact that one is short and one is tall, one slow and one quick. Even their brief appearances in Hamlet are played to maximum comedic effect, or maybe it's just because I already knew and loved them. They even get to bring their comedy relationship to the roles of the gravediggers in Hamlet. I was originally hoping to see Hamlet first followed by Rosencrantz and Guildenstern, but I'm glad I saw Rosencrantz and Guildenstern first because it allowed me to seek for and find the comedic moments from that play in the more serious one. The three leads are well supported by a great cast, including Andy Nogasky as Polonius (quite the comedian himself in both plays), Angela Janas as the sweet Ophelia driven to madness, and Patrick Lane and Jacqueline Correa as the king and queen. I find it interesting that each show has a different director (John Rando for Rosencrantz and Guildenstern and The Acting Company's Artistic Director Ian Belknap for Hamlet), because there is some overlap of scenes. Obviously they worked together closely; sometimes scenes are played out very similarly in both shows, sometimes the same action but with a different tone, and sometimes quite differently. The technical personnel is the same as both shows play on the same set, comprised of classical arches and stairs (designed by Neil Patel), with the same gorgeous costumes by Candice Donnelly. Sadly, The Acting Company is only in town for two weeks with these two great shows, through May 4. If you like classic Shakespeare, go see this fine production of Hamlet. If you like clever and fast comedy, go see Rosencrantz and Guildenstern are Dead. Or do yourself a favor and see both on the same day or back-to-back days for a deeper appreciation of both plays.